The Emirates Literature Foundation was established in 2013 by Royal Decree issued by His Highness Sheikh Mohammed Bin Rashid Al Maktoum, Vice-President and Prime Minister of the United Arab Emirates and Ruler of Dubai. The Foundation, home of the Emirates Airline Festival of Literature, is a not-for-profit organisation which supports and nurtures a love of literature in the UAE and the region, through a programme of varied cultural initiatives. Click here to learn more. In the UAE Year of Reading, the Emirates Literature Foundation, in association with The Executive Council of Dubai, held the inaugural three-day Conference focusing on the importance and value of translation in the Arab World and beyond. International and local delegates were joined by renowned speakers from around the world to give a vibrant and inspiring vision of publishing today and in the future. Conducted by the Emirates Literature Foundation in association with the General Secretariat of The Executive Council of Dubai. 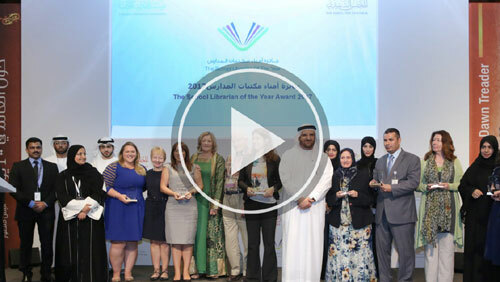 The School Librarian of the Year Award, in partnership with The Executive Council of Dubai, was established in 2016 to celebrate the inspiring work of the UAE’s best school librarians in public and private schools. Find out more about the people who manage the Foundation. Become a Foundation Friend and enjoy exclusive year-round benefits! We rely on our sponsors, benefactors and volunteers to make the region’s dreams come true. Be the first to know about Emirates Literature Foundation events. Our education events and annual competitions give young people the chance to meet their favourite authors and discover new ones, fuelling in them a lifelong love of reading for pleasure. Talking of Books features regular interviews with today’s greatest writers, with previous interviewees including bestselling novelists Chris Cleave, superstar children’s authors Jacqueline Wilson, Andy Stanton and David Almond, internationally-renowned philosopher AC Grayling and rugby legend Brian Moore. And if you’re lucky enough you’ll catch Literary Soundtrack at the end of the show, highlighting a song inspired by literature every single week. Click here to know more.